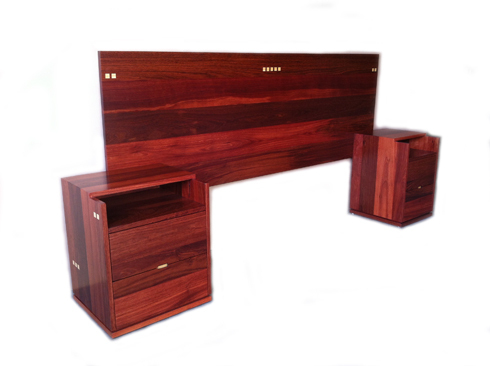 Bedroom suite made from Jarrah with Silver Ash inlays and feature drawer handles. This suite is a show of the craftsmanship we strive to achieve in all our furniture. The handles are recessed with a subtle Silver Ash backing. All drawers use concealed soft close runners that add to the level of quality. The suite consists of bedhead, bedsides and lingerie chest. It may be noticeable that one bedside is narrower than the other to accommodate the layout of the room (something easily done when custom made). It has been handed finished in Osmo's hard wax style Polyx oil which gives a real natural feel while maintaining our renowned quality and long term durability.